As Disciples, we all benefit from the fruit, the gifts, of our general ministries. These fruits are made possible only through the connections and support that grow in collaboration with our regions and congregations. This Easter, let us reflect on the transformative ways that we have been impacted by those ministries, and by the fruits of our shared work. Our general ministries provide other critical resources to Disciples congregations, like stewardship campaign materials, loans and financial services, and space for community building around shared values and traditions. Our ministries can bear these fruits because of our shared root system. We are rooted in Christ. As one branch of our vine grows, we can share more fruit with more people, from our doorsteps to the ends of the earth. 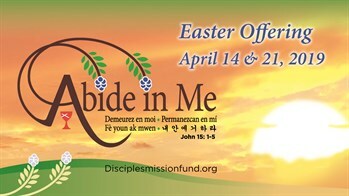 This Holy Week let us give of our own fruits to tend to the whole. Our ministries grow through your tending, nurturing, and caring. Your gifts to the Easter offering can transform our shared work. Please give generously to this year’s Easter Offering.